Ragnvald is a medium-sized Nordic ruin north of Markarth containing draugr. It contains three zones: Ragnvald Temple, Ragnvald Crypts and Ragnvald Canal. Ragnvald: Discover the secrets of Ragnvald. Two leveled draugr roam the steps before the entrance; one archer, one melee fighter. Other than a few scattered ingredient-bearing plants, the only thing of note here is the body of a dead Orc bandit hidden in a shrub to the left of and behind the entrance. A small coin purse and two loose septims lie on the ground next to him. There are also hidden septims scattered around this area so check the ground thoroughly. The first chamber contains a stone table with a dead draugr and a random poison on top and a burial urn on the ground beside the table. The ceiling has large holes in it and the sky is visible, but it is not possible to fast-travel from here. The only exit corridor leads downward and before doubling back, passing an area with a dead draugr, another random poison and an empty random soul gem lying on the ground, and then ending at a T-junction. To the right it quickly ends at an unlocked chest. To the left the path enters a narrow passage. This again doubles back as it descends. As you follow it, you will hear a swinging blades trap somewhere ahead. After a couple of turns, it leads to a doorway and a bridge into a large, complex open chamber. This is where you will find the first substantial opposition: two boss-level draugr, one on a platform on the far side of the bridge and the other below the bridge, with wooden stairs leading up on your right to the same platform. There is an oil slick, with an oil lantern hanging over it on the central platform, which you can use to your advantage. From the platform on the far side of the bridge, it is easy to see that there are several separate lower levels. There are several patches of fly amanita fungus in the chamber on both the upper platform and lower level and several hanging moss growing throughout the ruins. On your right, by the top of the stairs are two large urns, with another at the bottom. Descending the stairs brings you to a stone table with a potion of health and an iron helmet on top. Either side of this are a total of three sets of shelves holding several ruined books, a bowl of each; ectoplasm, fire salts and void salts and a burial urn. To the south are two small alcoves, the left-hand of these contains an unlocked chest and a potion of minor healing. Opposite this is a doorway to a passage with the swinging blade trap you could hear previously, a dead draugr that appears to have been killed by the trap and at the far end small room containing another unlocked chest and random potion of healing, a lever that stops the blades and just out of sight is an upright sarcophagus containing a slumbering, leveled draugr that will awaken as soon as you enter the room. From the platform, to the south is another flight of wooden stairs leading down, but this small area is completely empty. Just past these is a stone bridge that crossed to the south to another raised section, with another urn on the central platform opposite this bridge. There is another oil slick on the far side and two doors; a wooden one which is barred from the other side, and an iron one that takes you to Ragnvald Crypts. Heading across a pair of stone bridges to the north will take you to a wooden door, which is also barred from the other side. However beneath this door and guarded by a third boss-leveled draugr is an iron door that leads into Ragnvald Canal. At the western end of the central platform are stairs that descend to the main lower level that includes access to the Canal. These stairs descend to, in front of a sarcophagus with two large locks clamping it closed, which contains the remains of the dragon priest Otar the Mad, with the locks keeping him from getting free. Behind his sarcophagus are stairs leading up to raised spears blocking access beyond. As you approach the spears you will be able to hear the music for the word wall and see a boss-leveled chest. There are numerous large urns and burial urns in this area. While to the north, on a broken sideboard is an unlocked chest and leveled potion of healing and further back three empty sets of shelves with a sideboard between two of them holding a random potion and an empty random soul gem. To gain access to the chamber beyond the barred archway, you must insert Saerek's skull key, found in Ragnvald Crypts, and Torsten's skull key, found in Ragnvald Canal, into the slots in the sarcophagus, retracting the spears and releasing Otar the Mad. Resistance to lightning magic is a definite boon when battling him. After defeating him, be sure to loot his ash pile for his mask and lightning staff. The chamber behind Otar's sarcophagus contains a word wall for the Kyne's Peace dragon shout, as well as a boss chest and to the right among the cave-in is an apprentice-locked chest in the northwest corner and a dead draugr that can be looted further to the east. Before you leave, don't forget to remove the two skull keys from Otar's sarcophagus, as they are worth a fair bit of gold. Note: You can forgo getting the skull keys to open the tomb by setting a fire rune as close to the edge of it as you can. This will go off and damage Otar, causing him to explode out of the tomb and start attacking you. Once completed exit back the way you entered as there is no shortcut. Ragnvald Crypts begins with a small room containing a black sarcophagus that appears inert, guarded by a single draugr. There are several more urns, burial urn and sets of shelves holding a few food sacks around the room. Opposite the inert sarcophagus is a stone table holding two minor potions of healing. Two parallel passages lead out of this room. Notice that above the sarcophagus on the wall ledge, there is a burial urn that may appear to glow purple. You can reach that ledge with a single word of Whirlwind Sprint, but the urn appears to be empty. Of the two passages, the one to the left has four poison dart traps triggered by four successive pressure plates, but since the traps aim not at the plates but in front of them, pausing directly on the plate until the darts are exhausted allows safe passage. The passage on the right has no traps. Both end in a standard burial chamber lined with wall slots for remains. Following the crypt down, the first turn to the left will see three lower-level draugr and a boss revive and attack you. The passage curves right and then left, leading past a draugr in an alcove on the left side who will revive, and ends on the lower level of a medium-sized room with an upper level, where there is another draugr boss. There is a chest in an alcove at the opposite end of this room with a small amount of loot; be sure to disengage the apprentice-level trap on the right-hand side of the chest before opening or avoid the spear trap that shoots from the floor and watch out for a lower-level draugr wandering around the upper level of the room. A copy of the Restoration skill book Mystery of Talara, v 2 sits on the ledge behind the trapped chest. The exit to this room is on the right-hand side, a staircase to the upper level of the room. From here it is possible to go either left into another large room or right across a walkway you passed under earlier and into a passageway that leads back to Ragnvald Temple. 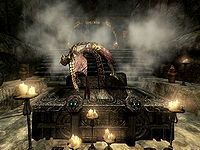 The large room on the left has the skull key on a trapped pedestal in the middle, which will raise the draugr slumbering in all three sarcophagi. A large black sarcophagus at the far end of the room contains the Guardian Saerek and two other sarcophagi on balconies to either side. It is possible to avoid this obvious trap by casting fire rune spells at each of the sarcophagi and fighting each of occupants individually, with the rear door still open for a retreat if necessary. Once complete the skull key can be removed in safety. Be sure to take Saerek's leveled two-handed weapon. There is an unlocked chest to the right of Saerek's sarcophagus and various burial urns and urns around the room and on the balconies. Also on the left-hand balcony by the sarcophagus is a leveled potion of magicka. This is another complex space with the floor covered in water and several draugr with a bit more fight in them than any encountered before: one will attempt to summon a frost atronach. To the left of where you enter where the first draugr is stood is a stone table holding a random healing potion and random empty soul gem and a set of shelves beside it with a random potion. Once the draugr are defeated, proceed to the left and ahead, keeping an eye on the bridges higher up in the room to shoot off any draugr passing over them. Past the wooden bridge over the water, there is an unlocked chest with a dead draugr lying next to it in a dead-end room to the right. To the left and forward, progress appears to be blocked by a raised bridge. To your right is a sideboard with a large urn and salt pile on top. The lever to lower the bridge is found on the floor a bit further to the left, or simply circumvented. Note that the black iron door behind the lever here is trapped by an expert-leveled tension cable on the bottom left of the door that triggers a flamethrower Statue trap; disarm or just wait for it to burn out. The dead-end room behind has an unlocked chest with a moderate amount of loot and a couple of sets of shelves, one of which has a bowl of bone meal next to some food sacks. Once across the lowered bridge you pass some urns and a set of shelves holding another salt pile before exiting. Continuing to follow the passages leads you to a chamber with the second skull key, this one on a platform with a bridge running to it and another leading off to the right, with stairs leading to the lower level on the opposite side. At the far end of the chamber there is a large black sarcophagus, the resting place of Guardian Torsten, flanked by two others on raised balconies. This trap can be dismantled the same way the previous one was. There is an unlocked chest to the right of Guardian Torsten's sarcophagus, and several urns and burial urns are around the room. Take the second skull key and return to the main chamber via the bridge leading east. The path leads through the main chamber on a higher walkway, continue straight across to a dead end with a novice-locked chest and random potion of stamina beside it. Be careful not to set off the swinging blades trap by stepping on the pressure plate at the start of the passage, immediately after exiting the main chamber a second time. There is an arcane enchanter with a random potion of healing and a random filled soul gem on top and opposite another set of shelves holding a novice-locked chest and another empty random soul gem along the way. This page was last modified on 16 June 2017, at 19:34.